I vividly remember one specific day. I had to take an exam and, in order to release some stress, I went fishing in the nearby Eerste River an hour or so before facing the professor. To me that sounded like a perfect way of running down the clock before that fatal encounter, because hunting trout on a small stream involves so much focus and attention that all other thoughts are banished from one’s mind. Long story short – I only raised one fish that morning, only to lose it in the ensuing fight! But the experience put me in such a relaxed frame of mind that the exam went swimmingly! In this article I am going to cover the basics of how to fish for trout in streams. I will attack the issue across a number of sub topics. Please enjoy and feel free to give any feedback in the comments at the bottom. Rainbow and brown trout (indigenous to the Northern Hemisphere) ended up in South Africa over hundred years ago due to the efforts of previous British colonists. They were stocked in various rivers and streams all over the country. Some of these locations were to their liking and they thrived. In this article I will focus exclusively on the methods, tackle and strategy to hunt trout on artificial flies on small streams and rivers. The focus will also be mostly on rainbow trout who are the dominant species by far on the streams I frequented. It goes without saying that fly fishing demands the angler to be in possession of, at least, a fly rod, a reel and fly line. A tear drop net is a very useful piece of equipment when fishing streams and small rivers, because it can sometimes be tricky to handle a captured fish safely in fast water. For clothing I would recommend a pair of canvas pants or shorts, depending on vegetation in and alongside the stream you will be fishing. Nowadays there are various thin, durable materials available which are well suited for these conditions. Choose something that offers protection again thorns and brushes and which dry relatively quickly. For stream fishing one seldom needs a fly rod heavier than a weight 4, but I would advocate a weight 3, or even less, depending on the size of the stream’s inhabitants. Do some research on the pros and cons of different brands and decide on one which will fit your pocket. Again, if you buy a decent rod and you are able to cast a flyline a distance of 10 metres you are good to go. Flyfishing on streams are not about distance casting – rather precision casting. You only need a floating line for stream fishing because you will cast small flies for short distances using an upstream dead drift technique. More on that later. When choosing a reel, ensure that the rod and reel are in balance by filling the reel with line and backing and placing the rod on your index finger just in front of the reel. The rod should remain in a horizontal position for a balanced outfit. As far as footwear is concerned I would suggest a pair of sturdy boots which can operate effectively on fast running water. The choice is yours. I have fished for years with a pair of cheap sneakers which served me pretty well! Just make sure that the soles of your choice offer adequate grip on smooth and mossy stones. As always when going fishing, don’t forget to take a pair of polaroid sunglasses with. This is essential for reducing the sun’s glare on the water surface and spotting fish. Although I fished in various locations over the years most of my fishing was done on the freestone rivers and streams in the Boland (Western Cape, South Africa). Hence my expertise stem from mainly fishing these areas. Freestone rivers are normally fast flowing with varying water levels, depending on the season. In the Boland that (normally) means high water conditions from June to September and very low water levels during the dry, hot summer months of December, January and February. The optimum fishing times are spring and autumn with the latter being my personal favourite. Like most other fishing, and because trout are predators, early mornings and later afternoons are the most productive periods. During rainy days or overcast conditions the fishing can be consistent throughout the day. That also applies to windy conditions when the water’s surface gets ruffled to such an extent that an approaching angler is not easily detected by the fish. The freestone rivers of the Western Cape are not very nutrient rich which means that the trout inhabiting them have to be quite opportunistic when it comes to hunting food. Various ubiquitous insect species form part of the eco systems of these rivers and different species occupy every conceivable niche of the water column such as the rocks on the bottom, various water plants, pools and riffles. Common types of stream insects include stone flies, caddis flies, mayflies and dragon flies. Trout hunt these insects actively in nearly all the stages of their life cycles and they subsequently form the bulk of a stream trout’s diet. 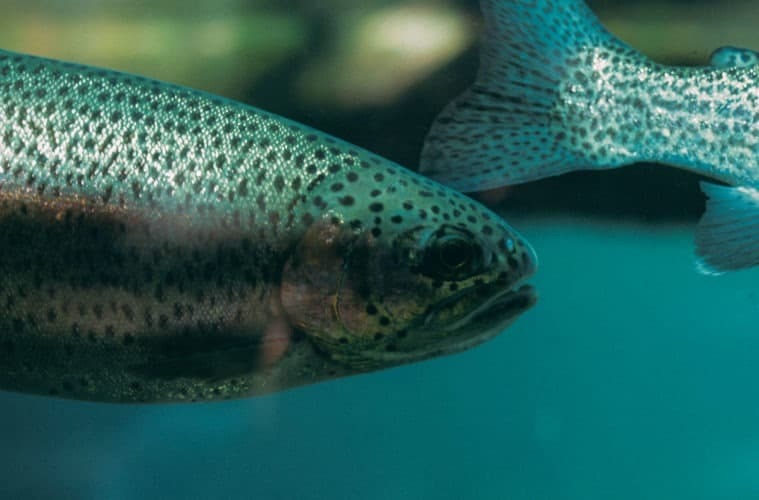 However, a substantial amount of a trout’s diet also consist of terrestrial insects which have no intention to be in the water but often find themselves in the drink due to unfortunate circumstances. Grasshoppers, cicadas, bees, wasps, beetles of all kinds, spiders and ants find them in this predicament more often than not. A big cicada or grasshopper naturally represents a huge nutritional bonanza for a hungry trout and it’s prudent to carry patterns imitating these invertebrates, especially during the windy seasons. As mentioned, a trout stream has a host of small invertebrates that call it home and therefore the opportunities for imitating these creatures are almost boundless. Although the flies will normally be on the small side it is also important to keep in mind that big dragonflies inhabit certain parts of the stream (especially the deeper pools) and it will do no harm to have imitations of them tied on long shank hooks stuck to your fly vest. Classic patterns like pheasant tail, gold ribbed hare’s ear and variations on those themes will never let you down. Tied in colours ranging between black, dark brown, tan and mottled on hook sizes 12 to 18 will ensure you have covered most eventualities. I am quite partial to a few classic flies like Royal Wulff and Adams tied in catskill fashion. For terrestrial patterns I prefer a Caribou Spider and also two very effective local patterns namely the DDD (also tied with deer hair) and the RAB which imitates long legged insects like spiders etc. As far as grasshopper patterns go few patterns will beat a well tied Dave’s Hopper. A small, simple caddis fly imitation is also one of the most productive fly patterns that I have employed over the years. It is important to point out that every angler will develop a preference in certain flies over a period of time which is only natural. It is however, counter-productive to become obsessed with choosing the right fly all the time, because it can result in self-doubt and unnecessary anxiety. In stream fishing the most important thing to remember is to have faith in the fly at the end of your line and to focus more on the strategies and tactics as outlined hereunder. The tactics for fishing small streams and rivers represents, in my humble opinion, the epitome of fly fishing. This is all about river craft, alertness, finesse and precision which can only be accomplished with such delicate tools as a small fly rod, a floating line and a dedicated angler. The first three golden rules for stream fishing (unfortunately I forgot which guru said it) are: stay out of sight, stay out of sight, stay out of sight! Most of the time you will fish in gin clear water less than a metre deep with nervous fish looking out for food and predators in equal measure. Therefore make sure that your keep a low profile as far as possible. Take time to locate the fish, devise a strategy and get as close as possible to its lie. When fishing upstream remember that the trout also faces upstream most of the time while on the lookout for any edible morsel that the current may carry their way. Get into the water as much as possible. Firstly it gives you a lower profile and secondly you are in the blind spot of most upstream fish which is very good from a strategic perspective. Once a potential trout lie has been spotted, use the minimum of blind casts in order not to alert or scare the fish. If you have to make one or two blind casts try and cast to the side first before dropping your fly in the trout’s “window” on the final cast. The current is both the trout’s ally and its enemy. It brings its food, but it also saps its energy while it is trying to hold a specific position. Therefore trout will seek out the quieter spots where the current is not so strong. Any obstacle in the stream will provide such cover and offers respite from the relentless moving water. Be on the lookout for such obstacles be they may rocks, fallen logs or sand banks and try to get as close to it as is possible. Cast your fly as close as possible to the structure, normally that’s where the stream is at its weakest and where the trout will be holing up. Most of the time you will only have a second or two. Pick up your fly before drag sets in and put it back on the spot in one smooth motion. Cast to the side, at the back and in the front of said obstacle. Also remember that a relatively big trout is quite able to hold its position on the stream bed behind a rock not bigger than a man’s fist. Therefore, even though you see a piece of fast water (a riffle) thinking that no trout will be able to hold its position in the strong current for a long period of time, chances are there are rocks on the river bed providing exactly that kind of cover. One of the advantages of fishing on a small stream is that you can get very close to your quarry – if you can stay unobserved! There is therefore very seldom a need to make long casts which give you much more control over your fly line and your fly. Try to make a minimum of false casts and to employ the roll cast whenever possible. If you can get as close as to only extend your leader and tippet to cover the trout’s lie, so much the better. Drag is a constant challenge when fishing in running water, because of the vagaries of multiple currents. Shorter casts enable you to keep your fly line on the water for shorter periods of time thereby minimizing the risk of drag. The difference between fishing a dry fly upstream and fishing a nymph is in the timing of a strike. Most of the times when fishing a nymph I put a strike indicator on my leader about 50 cm or so from the fly, depending on the depth of the water. Nothing fancy, a small piece of bright yearn will do. The moment I see movement at the indicator I strike. Lots of times it’s only the fly being checked by some underwater obstacle, but if it’s a trout inhaling the fly and you fail to strike instantaneously you will miss your fish. On the other hand, if you see a trout rising to your dry fly and snatching it from the surface pause momentarily before striking. The fish’s instinct is to grab the object and return to its lair as quickly as possible with the food firmly in its mouth. If you strike too early you will yank the fly out of its mouth before it had enough time to grab it. Stream fishing for both rainbow and brown trout is to me the ultimate combination of hunting and fishing, both pursuits which I am very fond of. Also, hunting trout on mountain streams took me to the most beautiful and unspoiled places known to modern man. Being alone in a mountain ravine at the break of dawn on a cool, crisp autumn morning watching the circles created by feeding trout taking tiny gnats from the surface of a pool or slashing violently at a beetle floating down a riffle while totally unaware of my presence evoked excitement and anticipation which, I can only imagine, were shared by my hunter-gatherer forebearers thousands of years ago. Few things in life can beat that.